$5 Friday Sale + $5 Shipping! PROMO CODE: TSFIVE258 Shop All! 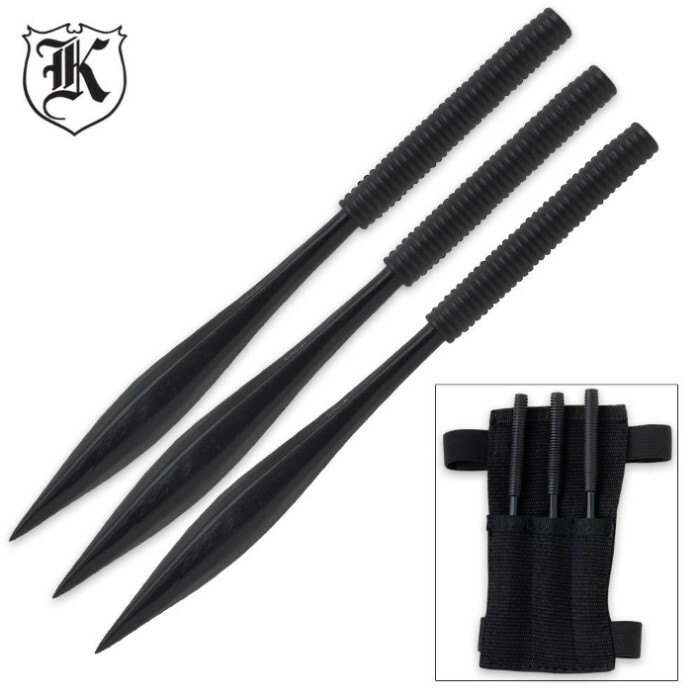 This three-piece dart set allows you to deal with any opponent from safe range. Each weighted steel dart has a sharpened spike end to penetrate the target. If the dart fails to stick, then the weighted force of the thrown dart will ensure a stun impact on your target. Each dart is constructed with ridged rubber grips to ensure a solid hold and control. 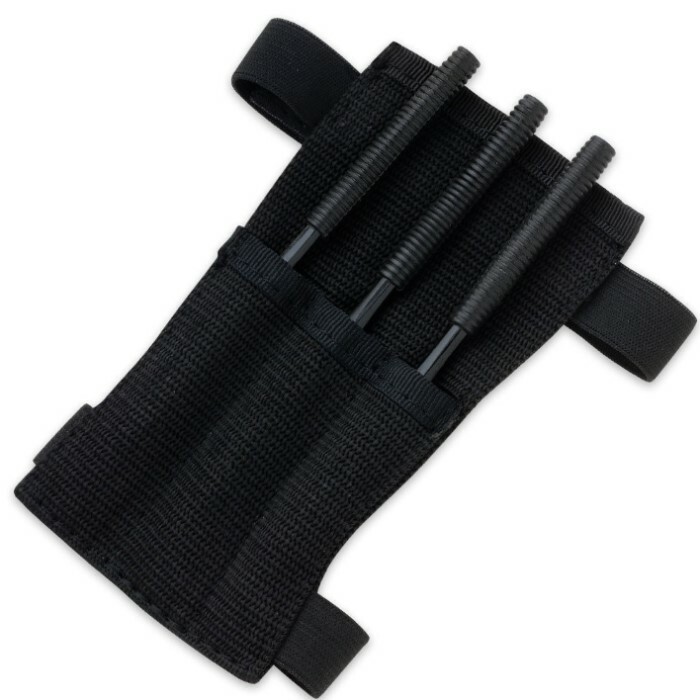 The set of three darts is housed in a ballistic nylon sheath for safe storage and access when you need them. Don't get caught short, get your set now! 6 1/4 in. long, 1/2 in. wide at the center of the point. Two out of three snapped at the handle. Just above the grip, which is defiantly a manufacturing issue, they just didn't weld them properly, took all three broken point peices and welded them to one wish I could upload a picture cause it's so much more functional now. Bogo is get them again. But not at that price. I actually bought these at a store in Chico, so I was able to see and check these out before my purchase. They feel like they'll throw well, but i have yet to test them out. They seem to have a good weight and even though the rubber grips can come off, they have to be pulled off, so I don't think they'll be much off an issue. The wrist sheath seems like it will last because of the construction, but it's nothing special. I don't have a big arm and the sheath fits pretty well, but I don't think it would work for someone with larger forearm. One thing I have noticed is that the paint will come off with throwing (not surprising though). I found this out by it slipping out of m hand and hitting a large piece of wood. I would definitely say these would be worth the buy though. Out of everything I have bought so far, I find these to be complete crap. I regret having spent the money. I got the 'buy one get one free' deal, but I still feel like I threw my money away. They look cheap, the rubber on the handle comes off, and they bend and break easily. The sheath is nothing to get excited about either. They are just a really bad quality item overall. I haven't done anything with these yet. I have two major complaints. One is definitely a manufacture issue and the other being a personal misunderstanding. The forearm sheath that comes with this set has no possible alternative wearability. The straps are not exceptionally adjustable. I'm a big frame man and I understand that. But the straps are too tight and it can't be reoriented. The second complaint is the product itself. The darts looked closer to a blade in the picture. Not a strange angular lump of steel. I have always been satisfied with this site but these darts were a big disappointment. These look like a great concept--if they had the base same as the tip. For traditional dart throwing, you want them very similar to a Cold Steel Torpedo in which both the tip and the base are exactly the same. The way we traditionally throw darts--which is straight and no spin and with the thumb actually holding the dart in the palm of the hand. Right now, the rubber will actually get in the way of proper throw. But I do like the tip design.